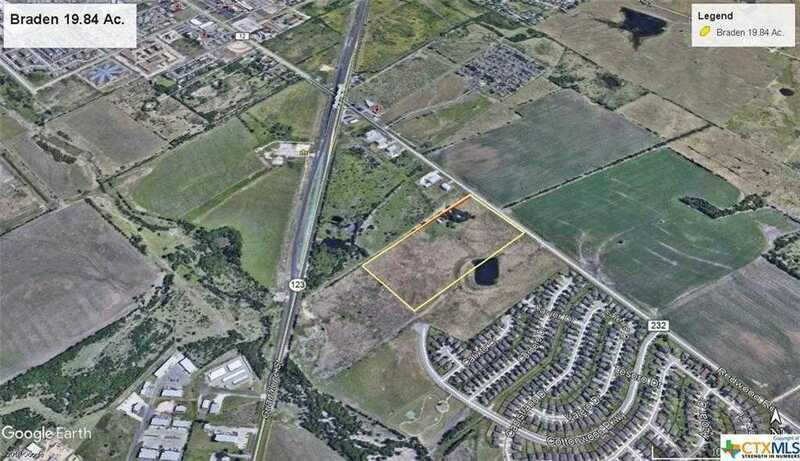 Approximately 19.8 acres prime for development. Located on the south side of Redwood Road between Hwy. 123 and El Camino Addition. This tract is adjacent to the city limits of San Marcos. City water and wastewater lines are located along the northwestern property line. There is a two story, 4 BR, 2.5 BA, 2884 sq. ft. home located in northernmost corner. Property ID #'s R15895 & R15896.&#xD;&#xA;Seller would like to retain possession of the home for 90 days after closing. Approximately 19.8 acres prime for development. Located on the south side of Redwood Road between Hwy. 123 and El Camino Addition. This tract is adjacent to the city limits of San Marcos. City water and wastewater lines are located along the northwestern property line. There is a two story, 4 BR, 2.5 BA, 2884 sq. ft. home located in northernmost corner. Property ID #’s R15895 & R15896. Seller would like to retain possession of the home for 90 days after closing. Please, send me more information on this property: MLS# 367151 – $1,310,000 – 2006 Redwood Road, San Marcos, TX 78666. I would like to schedule a showing appointment for this property: MLS# 367151 – $1,310,000 – 2006 Redwood Road, San Marcos, TX 78666.